Blues Reunion at Kapiti Playhouse this May - Kapiti Playhouse Inc.
Kapiti will enjoy a rare visit from one of New Zealand’s most celebrated and accomplished harmonica players on Saturday 14th May. Wellington’s Neil Billington seldom gets up this way but says ‘I was very keen to accept the invitation from Andrew London, my old comrade-in-arms, as we haven’t shared the stage for a few years’. Kapiti musician Andrew London appears occasionally on the Coast but says it is a rare privilege these days for him to collaborate with Billington. ‘Neil was a regular throughout the early 2000s with my trio Hot Club Sandwich, and we travelled the length and breadth of the country many times, playing some great gigs, and some pretty forgettable ones too. Highlights though were Wanaka, Taranaki and Taupo Arts Festivals, Queenstown, Nelson and Christchurch Jazz Festivals, Darling Harbour Jazz Festival in Sydney, Norfolk Island Jazz Festival and perhaps most memorably, a series of performances to international audiences at the NZ High Commission in Riyadh in 2010. The Saudi dignitaries who attended were intrigued by what Billington could do with that harmonica’. Billington is a specialist of both the traditional diatonic blues harmonica, but also the bigger and more complex chromatic harmonica used by artists such as Stevie Wonder, Larry Adler, Max Geldray and Toots Thielemans. He occasionally leads his own band at jazz and blues festivals and has twice visited Japan with Tauranga blues artist Mike Garner, playing a circuit of jazz and blues clubs in the Tokyo area. 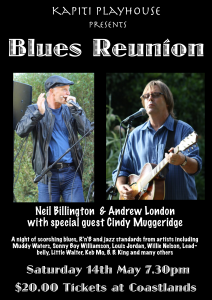 Special guest Cindy Muggeridge will join on piano, as the trio perform a repertoire of blues standards associated with artists such as Keb Mo, Sonny Boy Williamson, Leadbelly, Tarheel Slim, Muddy Waters and Louis Jordan.